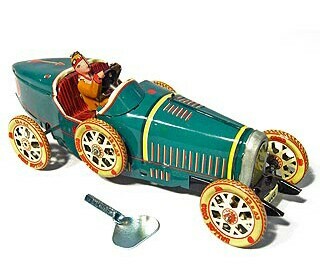 A classic Paya reproduction clockwork car. Bugatti Racer is a classic Paya reproduction clockwork car. This Bugatti Racer is a classic Paya reproduction wind-up car. Made completely of tin, this Bugatti features a green body with red details and yellow tin tires. The Paya Edition had raw metal details like the Spanish 1920's original. These models feature an element of hands on construction and therefore may show some minor scratches. Package: Craft Box with color graphic label.